A SUNY Orange education is affordable, accessible and exceptional. We can help you reach your goals. Whether you are planning to start here en route to earning a bachelor's degree, are seeking a head-start on your career or need a fresh start, join us at SUNY Orange and write your own story! Campuses in Middletown and Newburgh offer you two convenient options to pursue your studies. 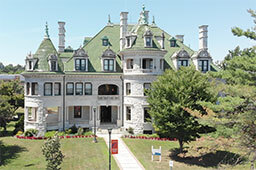 All of the College’s more than 40 degree and certificate programs are offered in Middletown, and seven full degree programs can be completed in Newburgh. If you were told that you could generate a return of nearly 3,000 percent on an investment, you’d probably jump at the opportunity. In today’s competitive job market, surveys have shown that a two-year associate’s degree can help a graduate earn approximately $400,000 more over his or her work life than someone with a high school diploma. Not only is a SUNY Orange education extremely affordable, it is a powerful tool for enhancing your future. Any community college can offer you a two-year degree path, but at SUNY Orange, we view our degrees as launching pads, not final destinations.